Politics rarely figures into the discussion at The Phocuswright Conference. But at this year’s event – which took place in Los Angeles just one week after the U.S. presidential election – politics and the implications of a Trump administration for travel and tourism came up frequently both on stage and off. When asked on stage, most executives were both careful and hopeful in their statements. They cited the difference between campaign rhetoric and actual policy. Some expressed optimism, given the President Elect’s background in the hotel industry, that his administration would take a pragmatic, business-friendly approach. These results do not necessarily mean the U.S. will see a corresponding decline in European visitors in 2017. This survey does not measure actual travel behavior. 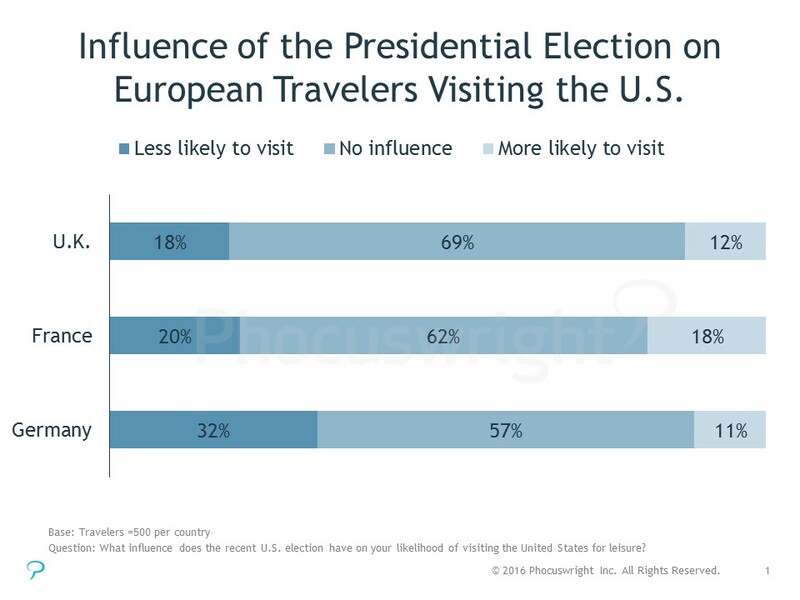 It is simply a gauge of traveler sentiment at a point in time: how they feel about traveling to the U.S., and if they are more or less inclined to consider the U.S. as a destination. Some of those “less likely” travelers may indeed still come to the U.S.